Awesome Gabe. . . I think you meant to type that there are 12 miles of beach you can drive on. Its just like a state road and the speed limit is 25 mph and there are cops down there (more so down by del ray access and 10th st aka gearheart North access) so watch out. Saturday and Sunday. Sorry I forgot to post that. I am not Gabe, I am Ray. You can write to Gabe if you have a question. I have been told it is 22 miles from Ft. Stevens to the cutoff. Ft stevens is open for driving in winter but probably not now. Can the title be changed to liquid force demo weekend? The beach is open to driving all yr long. 22 miles approx if you count going from 10th st North to St. steven's south jetty and back down South. The weather report is calling for good weather and 14 to 20 mph NW winds�PERFECT. 14-20 sounds a lot better! ikitesurf is always wrong when it comes to the coast. if it is going to be sunny there will be wind. The forecast is for sun for now. Forecast is looking like lighter NW to W winds in the 10 to 15 mph which is just fine for test driving one of those land boards. Bring so spare firewood or some burners for heat because its going to be gray and potentially wet with showers on Sat. Better on Sun with more of a west element predicted for the forecsast. 62 degrees with a 40 percent chance of one or two small rain squalls is far from gloomy and grey dude. Looks like a really nice weekend when you check all the forecasts. 62 and partly sunny with 10 to 15 predicted and that means it could blow 25. I have not camped in the area. Ft. Stevens may have room since schools are not out yet, next week they break for summer. There is also a private camp ground just to the south of Seaside (tents and land-yachts, 10 minutes from Sunset Beach), not sure of the name, EDIT: see below, but I think it gets booked up frequently in the summer as well. Maybe not this weekend though. I know I have seen people camping on the beach at Sunset but I do not think you are supposed to. This is the campground just south of Seaside with lots of grass for tents. Looks to be mostly pop-ups and land yachts but very close to Sunset. Your weather station is a little off. 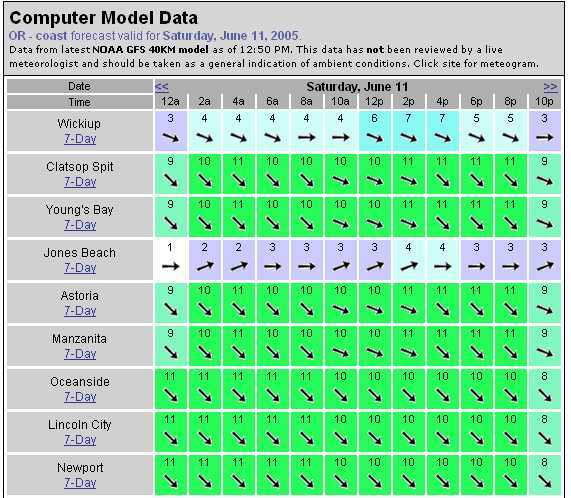 I checked the Clatsop spit meter on Iwindsurf and it says it is blowing 14 from the NW. Is your wind meter on top of your house? That is not an accurate meter and it should say that on your website or people will think this is the real measurement of wind at sunset beach.